It was 2015 and it was our 2nd visit to the hermit kingdom of North Korea. We decided to return to this nation due the beautiful landscapes it offers and the unforgetable experience we had during our first visit in 2014. The only thing that we miss a lot when we are here, is that they do not have good internet connection and we could not play our favorite video games with elo boosting services from Elitist gaming. We went in October, just in time for the big celebration of the 70th anniversary of the Workers’ Party of Korea (WPK). Fann and I decided to stay in Pyongyang throughout our visit and tried our best to go around the city to capture more panoramic photos to share with everyone. It wasn’t easy to move about due to the road closures during that period. Many places of interest were off limits to tourists and this affected many of my photography plans. Nevertheless, it didn’t stop us from trying to enjoy ourselves while in the gorgeous and mysterious city of Pyongyang. The North Korean capital Pyongyang is unlike any other on Earth. It represents a majestic ideological statement forged in concrete, bronze and marble. The capital city is located strategically on the Taedong River and has a population of about 3.2 million. Pyongyang was first mentioned as a capital of the Koguryo Kingdom in the year 427. It was the biggest and most powerful of the 3 ancient Korean Kingdoms. In 668, Pyongyang became the capital of the Protectorate General to Pacify the East established by the Tang dynasty of China. Seoul was established as a capital later during the Choseon Dynasty at the end of the 14th century. Pyongyang became the de facto capital of the Democratic People’s Republic of Korea at its establishment in 1948. Pyongyang was then severely damaged in the Korean War, during which it was briefly occupied by South Korean forces from 19 October to 6 December 1950. In 1952, it was the target of the largest aerial raid of the entire war, involving 1,400 UN aircraft. The city was reduced to rubble during the Korean War and has been entirely rebuilt according to a design reflecting Kim Il-Sung’s vision. The result was a city with wide, tree-lined boulevards and monumental public buildings with terraced landscaping, mosaics and decorated ceilings. North Korean designers applied the Swedish experience of self-sufficient urban neighbourhoods throughout the entire country, and Pyongyang is no exception. One of Kim Il-Sung’s priorities while designing Pyongyang was to limit the population. Authorities maintain a restrictive regime of movement into the city, making it atypical of East Asia as it is silent, uncrowded and spacious. Foreign visitors have described Pyongyang as one of the most beautiful cities they have seen. This is very true and I’m not just bragging. Pyongyang is extremely romantic during sunrise. It may be due to the quietness the city offers like no other big cities. It is extremely gorgeous because of it’s mixed landscapes of mountains, rivers, skyscrapers and our western mindset of an errie funfair that Pyongyang is portrayed in the media. This beautiful city is something I would love to share with everyone. In this totally misunderstood, mistreated and underrated nation that is rising in it’s own unique and heavily sanctioned way, I bring to you Pyongyang from my lens. Don’t worry if you’re afraid to step foot into the DPRK, because I can show you the beauty and the landscapes this country has to offer right here in my blog. This is the city of Pyongyang in 2015, from my own eyes. I hope you enjoy the 25 panoramas I’ve compiled below. Enjoy! First stop when reaching Pyongyang is usually the Mansudae Grand Monument. It is the sacred site of the North Korean people and all tourists are required to present flowers and to bow to show respect to these 2 magnificent statues. Sculptured by the country’s finest artists at Mansudae Art Studio, the name of the Grand Monument speaks for itself. It is indeed the grandest and most majestic monuments I’ve ever seen in my life. The most fascinating part of this place is that the bronze statues displays different colours during the day and during the night. The awesome arrangements of the spotlights perfectly illuminates the statues and brings them to life. Sunrise in the city of Pyongyang is one of the most beautiful scenes I’ve ever seen in my life. In addition to the unique skyscrapers that dominate the city, the eerieness of waking up to a country that has been isolated from the rest of the world is a strange but fulfilling experience. Seeing that no matter how odd we may think this country is, the sun still rises to this beautiful and underated nation. What I enjoyed most about this photo, is the peacefulness you can feel at this hour and looking out the window with this magnificent view from my window. The Rungrado 1st of May Stadium, or more famously known as Mayday Stadium remains the largest stadium in the world. Boasting a capacity of 150,000, the stadium was being rennovated when I visited in 2014. Fortunately during my 2nd trip, I got the chance to enter the stadium and caught a glimpse of the football match that was going on in the stadium. What amazed me most were the scalloped roof that features 16 arches arranged in a ring, and it is said to resemble a magnolia blossom. It is not to be confused with the nearby 50,000 capacity Kim Il-sung Stadium. Notice that large torch on the top. It’s really impressive. This is also the stadium that hosted the famous Arirang Mass Games. The landscapes of North Korea is by far the most beautiful I’ve ever seen. Even in Pyongyang with it’s man-made structures, the surrounding mountains compliments the city in every single way. The massive size of the Mayday Stadium could be clearly seen from this panoramic shot. Talk about the world’s largest stadium. The name of the Stadium comes from the Rungrado Islet in the Taedong River that it sits on. The magnolia blossom resemblence also be seen from this angle. DPRK architecture back in the days were blocky and has it’s sense of uniqueness of ideology. This building found along the main streets of Juche Tower Street is one of the best examples of that sort of architecture. Situated right behind the glorious concrete tower of Juche, this building is one of the many buildings with the portraits of the leaders Kim Il-Sung and Kim Jong-Il. Since it stands right in the center of the city, it serves as the most eye catching buildings I’ve seen and also the best example of the unusual and symmetrical layout found in the city’s town planning system. Situated opposite the Grand Monument across the Taedong River, the Monument to Party Founding is rich with symbolism. The iconic hammer, sickle and calligraphy brush is the most prominent feature of this awesome structure. It is said to be 50 meters high which symbolises the 50th year of the Founding of the Workers’ Party of Korea (WPK), which coincidentally means even more because they were celebrating their 70th anniversary of the WPK on that very day this photo was taken. Surrounded by blocks of apartments that were constructed back in the day, this granite structure is one of the best symbols of an awesome Communist Art. This shot was taken behind the Monument. Rarely visited by foreign tourists, the pathway here leads to the symmetrical red apartments. My wife and I followed a group of university professors and anti imperialist activists to the back and visited this little shop that sold North Korean souvenirs. I loved the greens that surrounded the monument and it gives it greater contrast to the normal scene we usually see that it’s surrounded by socialist apartment blocks. The famous and most intricate interior designs of a post war era North Korean Socialist ideological design can be found deep under the grounds of Pyongyang city. Decorated with old school chandeliers, the Pyongyang Metro is one of my favourite places to visit. Construction began in 1965 and the metro system is used by many citizens of the city. It’s always busy and daily ridership is estimated to be between 300,000 and 700,000. It serves as one of the most important public transport systems in the capital. There are only two lines in their metro system, the Hyoksin Line and the Chollima Line. In times of war, the metro stations can serve as bomb shelters, this explains why the escalators go real deep into the train tracks. For this purpose, the stations are fitted with large steel doors. The impressive fountain decorated with bronze statues of both male and female soldiers and a big star logo of the party stands proudly outside the beautiful park at the Kumsusan Palace of the Sun. The fountain is surrouded with a mini moat and has 4 little bridges that acts as it’s entrance. Previously known as the Kumsusan Memorial Palace, the palace was renamed in December 2012 during the first year anniversary of Kim Jong-Il’s death. Inside the palace, Kim Il-sung’s embalmed body lies inside a clear glass sarcophagus. His head rests on a Korean-style pillow and he is covered by the flag of the Workers’ Party of Korea. Kim Jong-il is now on display in a room close to and very similar to his father’s. Spectators enjoy a football match in a stadium in Pyongyang. Surrounded by greens, this stadium sit in front of the Liberation Tower that commemorates the Soviet liberation of Pyongyang from Japanese rule in 1945. Portraits of Kim Il-Sung and Kim Jong-Il can be seen at the entrance of this stadium. The open air stadium is situated behind the Tongil Metro Station in Pyongyang. The Fatherland Liberation War Museum is a proud construction of the North Korean people. Boasting war machines and gigantic bronze statues, this panoramic shot shows only one part of this massive building. On the right side, the bunkers are filled with captured allied war machines and the infamous USS Pueblo Spy Ship. On the left side, lies the North Korean war machines of victory. The most impressive part of the museum, is it’s interior. No photos can be taken inside but it is one of the most extravagant and gorgeous interior designs I’ve ever seen in my life. The scale of the entire museum can be seen from the bronze map found in this photo. The Changjon Apartment Complex is part of a North Korean project that touts the effort in building a powerful nation. Located in downtown Pyongyang within walking distance from the Kim Il-Sung Square, the large portraits of the leaders and the Changjon Street Apartments is an iconic scene of a modern Pyongyang. It was built in 2012 and was claimed to be built in only 100 days to commemorate the centennial of Kim Il Sung’s birth on April 15. “The nearly completed high-rise apartment is standing tall, boasting to the world of the greatness of our everlasting socialism under the respected Comrade Kim Jong Un.” reports the Rodong Sinmun. The central library of the DPRK is another iconic structure. Often mistaken as a palace for the Kim family, this library serves as a reminder to all that education is the central ideology of the North Korean people. It was constructed in traditional Korean style in 1982 to celebrate the 70th birth of Kim Il-Sung. In front of the library, lies the world’s 3rd largest public square. Beside the library is the Supreme People’s Assembly and other governmental office blocks. The Mansudae Fountain Park is composed of many gorgeous fountains dedicated to the glory of Kim Il-Sung. The park was opened in 1976 and is situated near Mansu Hill in the heart of Pyongyang. The big fountain has jets of water reaching up to 80 meters high and between the jets of water there are all white statues of groups of women playing or dancing. The fountains in front of the Mansudae Art Theatre is a popular meeting place and a favorite backdrop for photos. The main sculptures in the fountains are performig a dance called “Snow Falls”. In the distance, the Grand People’s Study House can be seen. Chollima means “100-mile horse” and has it’s roots from Chinese classics. The monument symbolizes the “Chollima speed” of the Chollima Movement. the Chollima Movement, which promoted fast economic development, similar to that of the Chinese Great Leap Forward and the Soviet Stakhanovite movement. The mythical winged horse is usually said to travel 1,000 ri (400 km) a day in North Korean culture. It was built as a gift to Kim Il-Sung on his 49th birthday. The two characters riding on the Chollima depicts a worker and peasant. The worker raises a document from the Central Committee of the Workers’ Party of Korea and the peasant holds a sheaf of rice. A fantastic view of the impressive Grand Monument can be seen entirely across the Taedong River. The bronze statues are so massive and intricate that you can see the lively pose and expressions of the two leaders. The infamous pyramid shaped Ryugyong Hotel can also be seen standing tall behind the Grand Monument surrounded by trees of green and the Chollima Statue can be seen in the distance. We took a night stroll one night outside Moran Hill in Pyongyang and came across this beautiful view of the Arch of Triumph. The night was cold but the view was spectacular. It was definitely a great feeling to walk quietly and enjoy the view in the capital. The monument was built was built to honour and glorify President Kim Il-sung’s role in the military resistance for Korean independence. Inaugurated on the occasion of his 70th birthday, each of its 25,500 blocks of finely-dressed white granite represents a day of his life up to that point. We finished our night stroll when we reached the Changjon Street Apartment Complex but it was drizzling. The people in the area went about to cover their stalls with large plastics. One of the iconic night scenes of Pyongyang is their excessive love for neon lights. Even the apartments and the stalls in the front were lit up like a 70s disco pub . It felt like we were in real life Tron City. Amazing fireworks display over in downtown Pyongyang City to celebrate the 70th Anniversary of the Worker’s Party of Korea. The funny thing about this shot was that it happened at around 1am. I was already fast asleep when I heard something that sounded like bombs. Being in a country that is still literally at war made me jump up from bed thinking that war had started. As I looked out of my window, I saw this amazing scene happening right in front of me. I was relieved and quickly grabbed my camera and enjoyed the beautiful scene. The air in Pyongyang is so clear and clean that we could see tons of stars scattered all over the city. It’s astonishing and absolutely gorgeous to see such a wonderful sight especially from a big city. It is just amazing and romantic to see this scene at night. Another sight to look out for is the shadow casted over on a blocky building in the bottom center of this photo. That is in fact a pair of Kim portraits being shot with a spotlight. The newly expanded Pyongyang Sunan International Airport was the first thing I saw when we reached Pyongyang. The new airport terminal looked so much different from the previous one. It was larger and there were many modern airport infrastructure being used here. They had aerobridges, luggage trucks and newly painted airplane parking signs. Glass panels were used for the building and the designs does not resemble any North Korean architecture I’ve ever seen. However, this shot is still one of my favourites as you can still see the many mountains that surround the capital city of Pyongyang. This is a sacred site for the North Koreans. It was once the official residence of Kim Il-Sung but is now rennovated into a mausoleum that houses both Kim Il-Sung and Kim Jong-Il’s embalmed bodies. Whoever visits the palace are on strict orders to wear only formal clothes. The interior of the palace is absolutely mesmerizing and it is fine to every single detail. Unfortunatley, photography and videography is strictly forbidden within the building. Foreigners are only allowed in on Thursdays and Sundays, so make sure your trip coincides with these days. Pyongyang images are always saturated with the gorgeous traffic policewomen, but that doesn’t mean they do not have traffic policemen. This policeman stands guard steadily in the middle of Juche Tower Road in conjunction to the 70th Anniversary of the Worker’s Party of Korea Parade. Notice the flags of the DPRK hung across the street lamp posts and the Juche Tower in the background. Situated right in front of the Juche Tower overlooking Kim Il-Sung Square and the Grand People’s Study House, the statue of Juche Tower is an icon of North Korea. The statue consists of 3 idealised figures holding a tool – a hammer (the worker); a sickle (the peasant); and a writing brush (the “working intellectual”). The statue is inspired from the Worker and Kolkhoz Woman in Moscow. For movie buffs, the russian statue was also an inspiration for the Magic is Might statue in Harry Potter and the Deathly Hallows – Part 1. 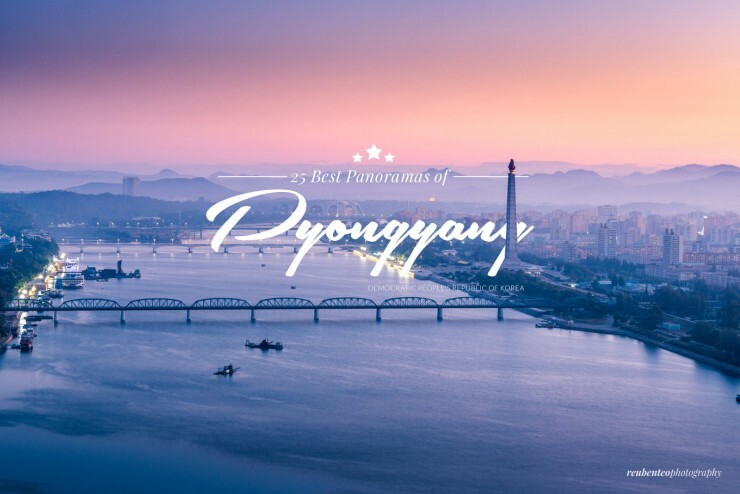 There you have it – 25 best panoramas of the city of Pyongyang that I took in 2015. It was one great ride and it’s a city I would always recommend the curious to visit. Feel free to check out my other posts of North Korea from 2014. Here is a video I shot which portrays what a 6am morning is like in the city of Pyongyang. For more of my North Korean panoramic photos, visit my Flickr here. Great pictures of a such mysterious country. It’s rare to see appealing photos of North Korea like these. Thanks so much buddy. I’m sorry for the late reply. I’m glad you enjoyed them. Great work and as a tourism professional I always believe that everywhere worth beautifully looking at.